Last week I got my hands on a Raspberry Pi and this weekend I finally found some time to sit down and get my first project with a Pi going. Naturally I ran into several issues and with today being Pi day, I thought I’d share my notes. Last year I started a project with a bunch of colleagues where we try to monitor our gas, water and electricity meter. I’ve presented what we achieved so far at Cloudbrew last year. The aim is to build an IoT solution with a mobile application, cloud backend and lots of devices (Arduino’s and Pi’s for now). I didn’t want to wait on us finishing this to gather readouts from our utility meters so I thought I’d grab a Pi or two and get started. Since we already had figured out how to get the readouts I thought an hour or two would be all I need to put the solution on a Pi. First thing I did was to download Raspbian Jessie Lite and follow the steps from the official site. Jessie is a headless operating system, since I won’t be connecting a monitor. I’m not choosing Windows 10 IoT for now because the onboard Wifi, a main selling point of the new Pi, is not supported at the time of this writing. 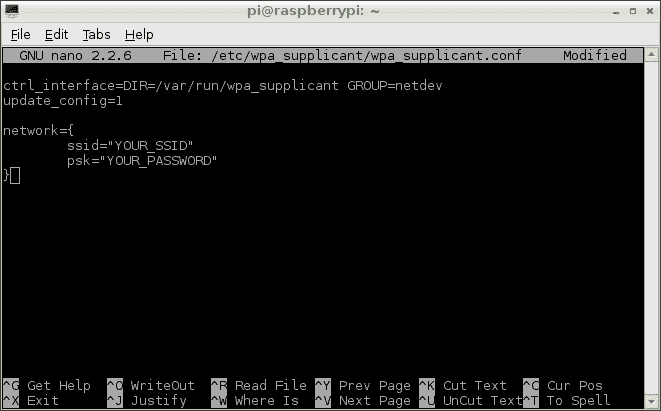 After connecting an ethernet cable and a power supply I used PuTTY to open an SSH session to connect to the Pi. So far so good. The next task was to get the Wifi going. This turned out to be rather easy. Open “/etc/wpa_supplicant/wpa_supplicant.conf” in your editor and add the SSID and password of the network you want to connect to. Like most of the time, someone else had written down the instructions. I unplugged the ethernet cable and connected via Wifi. I then updated the Pi with “sudo apt-get update” and “sudo apt-get upgrade” so I was running the latest bits. Next up, programming. I briefly looked at the options I had. I could program in C, Python, C++, and many others. But time was limited this weekend. I live and breath .NET so I changed the list to .NET Core or Mono. I chose Mono because I had experimented with it years ago and .NET Core has not yet reached a stable point. Toying around with alpha and beta releases was not on my todo list for today. The default package repository has a very old version of Mono, so you need to follow the instructions on the Mono site. Add the signing key and package repository to your system then run “sudo apt-get install mono-runtime”. 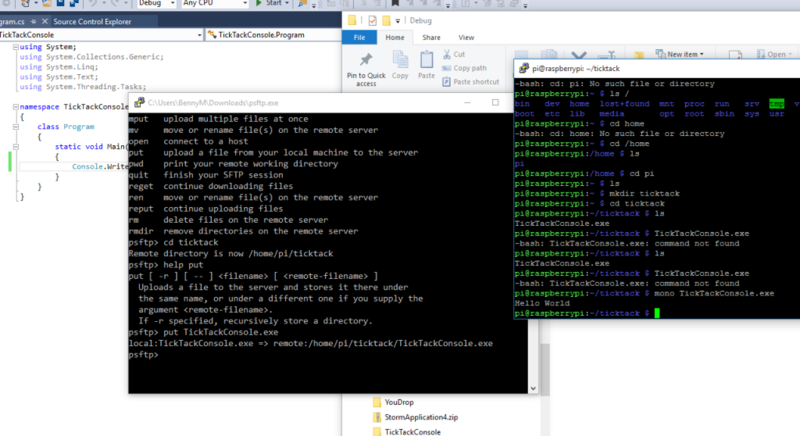 I created a Hello World console application on my Windows 10 laptop and used PSFTP to copy the exe to the Pi. It just worked. Then the search was on to find a library to interface with the GPIO pins on the Pi. After looking around I found Raspberry Sharp IO . It had the API I wanted. You can use the event model to track changes in the GPIO pins, just what I needed. 40      ../sysdeps/unix/sysv/linux/waitpid.c: No such file or directory. After that the application started again. The button I had connected to the pins activated my code. Yay! With that my time for the weekend was all used up but I’m now ready to be create my actual application. Did you run into similar problems? Is this to do with floating point arithmatic problems? No I haven’t. You could try the suggesion by Xavier. 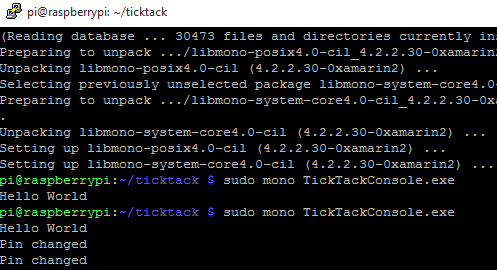 Install all of mono and see it it works. Then try to work back to include just what you need. Or just keep the entire install :). Hi, I had the same problem “Illegale instruction”. Someone fixed it? Instead of installing mono-runtime, I’d suggest installing mono-complete. I try to keep the dependencies and install size as minimal as possible. Hence I only include the stuff I need. The install of libmono-system-core4.0-cil was just what I needed to get my ported VS app to run on Rasbian without log4net coughing up a hairball. This page is amazing! I’m new to the pi and just curious if I need to download sharp or if just calling it in my program is enough?